In a back-and-forth over email, Kurpershoek discussed why this sort of “romantic” poetry has disappeared from the landscape, why he calls it “romantic” at all, and how the survival of this type of poetry “hangs by a very thin, tenuous thread.” This is the first in a two-part series of interviews about Arabian Romantic. The “Romantic School” of Nabati poetry, you write, came about in a particular region (the High Najd) with particular geography, cultural practices, and a particular relationship between sedentary villagers and dynamic Bedouin. You write that they represent a turn away from puzzle poems and wordplay-for-the-sake-of-wordplay, and a turn toward oral traditions. Who were the Romantic School’s predecessors? Marcel Kurpershoek: We do not know about the immediate predecessors. 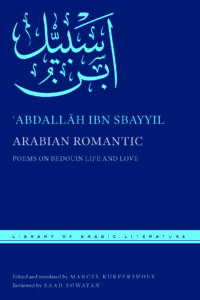 A lot of research for the book went into establishing context: the intellectual milieu of Ibn Sbayyil, inspired by Charles Pellat’s great book: Le milieu basrien et la formation de Jahiz; and the roots of his work and genre in the tradition of classical Arabic poetry. I read and studied whatever I could find on classical Arabic ghazal poetry. I made index cards for all aspects and themes and motifs in Ibn Sbayyil’s work. And I compared the two. The result was amazing: virtually every image, turn of phrase, motif, and theme had an exact correspondent in early Arabic poetry, up from pre-Islamic to the beginnings of the Abbasid period. The classical inventory has been made in greatest detail by Professor Thomas Bauer, in the German tradition of great precision and thoroughness, in his book Liebe und Liebesdichtung (one cannot really study Arabic literature without knowing German). Looking especially at the seventh century’s most famous ghazal poet ‘Umar ibn Abi Rabi’ah. I mapped these correspondences as well as the differences. So we can say for certain now that the Najdi (Central Arabian) ghazal, and Nabati poetry as a whole, are linear descendants of the early classical tradition. It is, however, much harder to trace this line of descent during the intervening centuries. The early poetry was registered and published by the Arab philologists of Basra, Kufa, and Baghdad in the eighth through 11th centuries or so. The earliest manuscripts with Nabati poetry that we have date from the 19th century. There must have been much older ones, but they were lost or haven’t been found yet. It is simply unthinkable that there is no direct link and that the two arose separately. How the continuity happened, we can only surmise: I’d say a combination of oral and written traditions and their interaction, as explained in Saad Sowayan’s Nabati Poetry. I think this book, as the previous one, was as much or more about research as about translating, because it is still very much a virgin field, whereas most of LAL’s classical texts have been part of an Orientalist canon for centuries, which translators can draw on and refer to. And here we come to a hidden objective: to get Nabati poetry accepted as part of or an adjunct to the studies of classical literature, overcome the prejudice and technical hurdles. That was the purpose of the contextualization and is mostly found in the notes to the translation, which are in fact an independent study of this subject in their own right. What do you see as the technical hurdles for getting Nabati poetry accepted as part of, or adjunct to, the studies of classical literature? MK: Many reasons, in all Arab countries. But the problem is especially acute and intractable in Saudi Arabia. In Saudi Arabia Saad Sowayan—who is highly respected as a great scholar, and who has devoted his life to the study of the indigenous traditions—has fought this battle ad nauseam. In essence the opposing argument is that studying and appreciating Nabati poetry and storytelling (which is not exactly the same as “vernacular,” and in a sense it is even more classical than modern classical Arabic because it is replete with vocabulary, images, and phrasing that are more akin to the earliest Arabic, even pre-Islamic models) encourages elevating the vernacular to an officially recognized status, thereby undermining centuries of Islamic and pan-Arabic scholarship and the religion of Islam, based on the ultimate model of the best Arabic, the holy Qur’an. Secondly, once this Pandora’s box is opened, there is no stopping it: in a huge country like Saudi Arabia there are many regional vernaculars. At worst, it is seen as a conspiracy to undermine the religion of Islam and the cultural unity of the Arab world. Map of Arabia. Public Domain via the Dutch National Library and Wikimedia Commons. In actuality, of course, there is no contradiction between teaching and studying classical Arabic and studying and appreciating what exists as a matter of fact, practiced by millions, such as Nabati poetry, which has festivals devoted to it, like Million’s Poet (admittedly in the Emirates, but with majority participation from Saudi). In Saudi Arabia, this subject is turbo charged because the country is the guardian of the holy places Mecca and Medina, because its political legitimacy is built on a very strict and fundamentalist interpretation of Islam, and of course because it encompasses the birthplaces of the Arabic language itself. 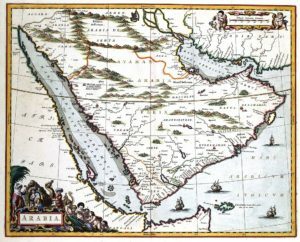 The glaring paradox is that there is no country with such a vibrant vernacular literary tradition (Nabati) as Saudi Arabia, probably because of its long isolation and because of the tribal, regional, and familial identities that have been enshrined in Nabati poetry and attendant narratives and have been nurtured over centuries in oral transmission. Saudi princes were enthusiastic about my Al Arabiya television series on Nabati poetry that included an episode about Hmedan al-Shwe’ir, who wrote Arabian Satire, and I was filmed talking to the head of the library of the holy mosque in Mecca, who happened to be one of Hmedan’s offspring and who was very proud of his ancestor, and so on. What was the genre divide in the Najd between a poet and a storyteller? MK: In the Najd, or Cental Arabia, there is no profession of story-teller, or ḥakawati, as in Syria or as there used to be in Egypt. In each group of people, you find people who know poems and stories. Some are very good at it and like it a lot, and on social occasions they entertain company. Of course, poets always know poems or verse by other poets and recite them. Poems are usually associated with an occasion that is explained in a story, and these stories start to lead a life of their own down the chain of transmission. After a while, the story is what people believe to be the occasion or the explanation of a verse. The poem itself changes, though probably less than the story because of its form (rhyme, meter). At least, people believe that a poem is the original “truth” or cannot be changed, because people know it and would detect attempts at “falsification.” Compared to Syria and Egypt, therefore, the Najdi tradition is one of an interactive, strongly participatory oral culture. I think it is connected to tribalism, because each member of a tribe feels responsible for the “correct” version of its history. You suggest this style of poetry has now run its course. In the Nabati poetry being written now, do we see echoes of this “Romantic School,” or are the concerns and context are too different? MK: I deliberately made the point of tracing Ibn Sbayyil back to ‘Umar ibn Abi Rabi’ah in the seventh century and forward to al-Dindan, the poet I have known personally, as I recorded and edited and translated his oral diwan. He died in 2004 (he was paralyzed and his tent burned down). The imagery and language depends on the natural desert environment. By then people who knew it, who rode camels instead of cars, had gone. And so did the poetry, naturally. Even the oral capacity of ability to memorize has gone. I noticed that poets in the most recent Million’s Poet competition were allowed to read their poems from an iPad, unlike a few years before—the horror! MK: I like Qabbani a lot and a verse by him was the title of one of my books in Dutch and my inaugural lecture as a professor in Leiden: Who tolls the bell of death for the Arabs (a bit English Dutch, probably). But he is a poet in the Western tradition of Arabic poetry. Therefore, the western concept of “romantic” applies to him. He composed poetry in the western way: as a literate man, pen and paper in hand, so to speak. He is not part of a tribal oral tradition. He certainly would have trouble understanding and appreciating this kind of poetry. Also because he takes the literate classical view without bothering about its oral roots. For your precise question, I ventured an answer in one of the notes (also to do with al-Mijmaj I believe), i.e. it was seen as a suitable, politically neutral pastime, amusing as a game with many variations, that oiled the machine of social gatherings with acquaintances and strangers in the circle. Can you talk about why you translated madrasah wijdāniyyah as “Romantic School” (vs. for instance sentimental, nostalgic, passionate, wistful)? You talk, in the introduction, about why sentimental would be wrong, with its association of feelings as a guide to truth, and in the modern sense, trite. But why did you settle on romantic when, as you say, the Anglophone idea of “romantic” is distant from this poetry? 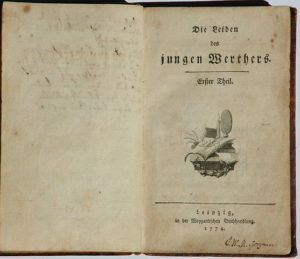 First edition of Goethe’s Werther. © Foto H.-P.Haack via Wikimedia Commons. MK: I include Goethe’s Werther in the category of “sentimental,” and by romantic I mean the traditional British view of the Bedouin, a more robust romanticism. There are many reasons for the British enchantment with the Bedouin. But what matters here is that I was struck by the uncanny resemblance of Ibn Sbayyil’s view of the Bedouin to the traditional British one. In my book, I try to explain why Ibn Sbayyil takes this view. But as I argue in a forthcoming article on the influential early 19th century Arabian traveler and scholar J.L. Burckhardt, this British view itself seems to have antecedents in much earlier Arab views of the Arabian desert culture, e.g. in 15th century Egyptian scholar al-Suyūṭī’s work. You have described the best of the Romantic School love ghazals here and elsewhere as “delicate.” Can you talk about what you mean by that? To me, their appeal is that they are vivid and muscular in painting a portrait of an internal and external landscape, particularly the extended camel and bird-of-prey metaphors. MK: They are delicate in comparison with macho Bedouin poetry. In a footnote of Brill volume 2 [Oral Poetry and Narratives from Central Arabia, Volume 2 Story of a Desert Knight], on the poetry of a desert knight, Shlewih al-‘Atawi, I mention that the transmitter and Shlewih’s great-grandson Khalid considered Ibn Sbayyil a kharrāṭ, a man who chatters and gossips like an old woman, and ghazal as an unmanly occupation, rather shameful. I had trouble persuading him to recite some poetry by poetesses of his tribe (which he did in the end). So “delicate” means: he makes an effort, in a poetic sense, to put himself into the shoes of the beloved, and makes her argue her point of view. And yet does he really put himself in her shoes? A few scholars have lately started reading classical Arabic love poetry with something like a #metoo lens. While he suggests he doesn’t force himself on women, he cannot seem to imagine a woman might just not be into him, and if she is, she should probably get stones kicked in her face. What can we guess about women’s lives from the poetry? MK: All this is part of convention, the censurer, the slanderer. Not necessarily any relation to his real life. He may have been a hundred percent faithful and solid and stolid husband. Most likely, actually. It is poetry and fantasy, I think. It is not meant to inform you about women’s life at the time. Also, he obviously refers to daughters of powerful chiefs, high class privileged women. He is far from that social level, but allowed the surrogate of dreaming about them. In the end, therefore, it may, or may not, tell you something about some of the workings of his mind and that of his audience. Would his daughter Sarah have been one of a few women who knew Ibn Sbayyil’s work? I suppose there is no way for us to know how many women were listening behind doors, memorizing the works. MK: And behind the tent wall separating men and women’s compartments. There would always be holes in it, and there are many stories how women would intervene in the discussions of Bedouin men, which was less easy and common in settled communities (see Hmedan al-Shwe’ir’s view of it). I was only told about Sarah, not about other women from his household. Read the second part of Marcel’s interview here.